Brush cut sides of baguette with melted butter; sprinkle with 2 cloves of the garlic. Place bread cut side down on grill over medium heat. Cover grill; cook 1 to 2 minutes on uncut side until grill marks form. Turn; cook 2 to 3 minutes on cut side until grill marks form. Cut into slices on the bias. Set aside. In small bowl, mix coconut milk, curry paste and soy sauce. Discard any broken-shell or open mussels that do not close when tapped. Pull up all 4 sides of each sheet of foil. 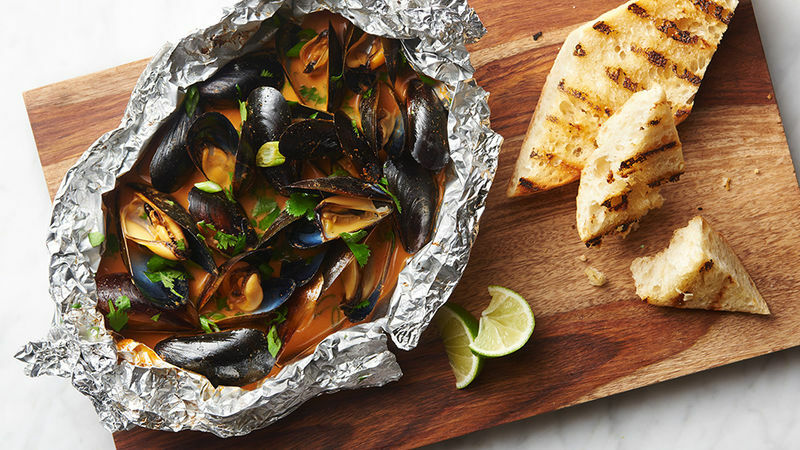 Divide mussels, green onion whites and remaining 2 cloves garlic evenly among sheets of foil; pull sides of foil up around mussels mixture to make a bowl. Pour coconut milk mixture evenly over each. Squeeze 1 wedge of lime over each. Wrap foil securely around mixture. Pierce top of foil once or twice with fork to vent steam. Place packs on grill over medium heat. Cover grill; cook 6 minutes. Rotate packs 1/2 turn; cook 5 to 7 minutes longer or until mussels open. Remove packs from grill. Carefully fold back foil; discard any unopened mussels. Sprinkle with cilantro and green onion greens; serve with remaining lime wedges and baguette. Look for PEI (Prince Edward Island) mussels, as they are consistently sweet and tender – and sometimes they are even sold debearded! Serve with 2 cups cooked rice instead of baguette.